Didn’t know September 3 was Skyscraper Day? Well, us neither until today. But we don’t need asking twice when it comes to celebrating Dubai’s stunning architecture. From the world’s only seven star hotel, to the world’s tallest tower, and the world’s highest four and five star hotels, Dubai is home to some pretty wow-worthy buildings. So, we’ve rounded up six of Dubai’s most iconic skyscrapers, in celebration of World Skyscraper Day. The world’s tallest tower at over 828 metres tall, the Burj Khalifa has served as everything from a backdrop for a stunning fireworks display, to a scoreboard for the 2018 Fifa World Cup. As well as being the world’s tallest tower, the Burj is also the record holder of the highest observation deck, highest number of stories at an impressive 160, and also boasts an elevator with the longest travel distance. Cayan Tower, also known as Infinity Tower, is a 360-metre tall residential tower in Dubai Marina. Designed by the designers who also conceptualized the Burj Khalifa, it became the world’s tallest high-rise building with a twist of 90 degrees when it opened in 2013 (a record which has since been surpassed). It currently ranks as Dubai’s 21st tallest tower. The world’s only seven-star hotel, the Burj Al Arab boasts several records. Designed to look like the sail of a ship, it’s also the tallest building in the world used exclusively as a hotel since its completion, and the tallest hotel on an island, either man made or natural. Now known as the tallest hotel in the world, construction first began on the Gevora Hotel building back in 2004, before it was officially inagurated this year. At 356 metres tall, it is just one metre taller than the JW Marriott Marquis, which previously held the record for the world’s tallest hotel. Emirates Towers is a two-tower structure in Dubai’s Financial Centre. 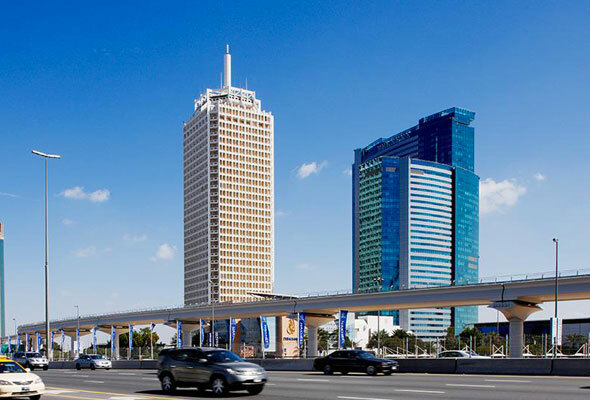 Split into a 54-storey office tower and 56-storey hotel (Jumeirah Emirates Towers) connected by a retail boulevard. The office tower, known as Emirates Tower One, is currently the 41st tallest building in the world. It might not be much of an architectural marvel now, but back in 1979, Dubai World Trade Centre was Dubai’s first skyscraper. The 39-storey building has since been eclipsed by many taller towers in the city, but it’s still known as one of Dubai’s icons.